Newborn Session w/ the Ocampo Family — Darline and Co. Remember the escape room emerald green maternity section from a few months ago? Meet Fabian - the son of Isabella + Alex Ocampo. 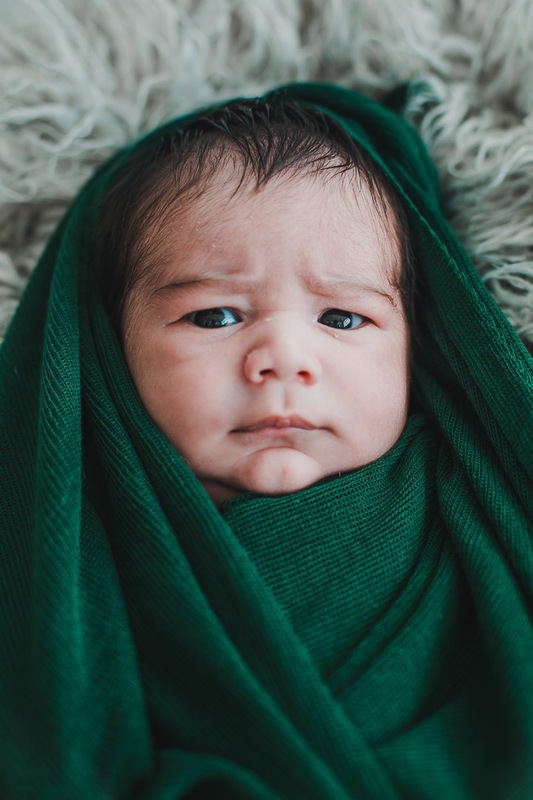 Of course, we had a green newborn wrap for him to tie everything together. Doesn’t he look so thrilled to be wrapped in green? (haha) It’s best to photograph newborns within the first two weeks from being born. They generally will stay asleep and pose more for you. I try to tell parents to plan their sessions around nap time after they have eaten and have a clean diaper. Use a space heater too because babies tend to be cold when they’re this young. Things don’t always go as planned as little man was wide awake for the entire session. Either way, we were able to freeze some moments in time that mom and dad were happy with.